Behind every Catholic teacher, there is a believing community. Pope Francis has given this reminder to the community of the Catholic University of Portugal, on the occasion of the 50th anniversary of its founding today, Oct. 26, 2017, in the Vatican. 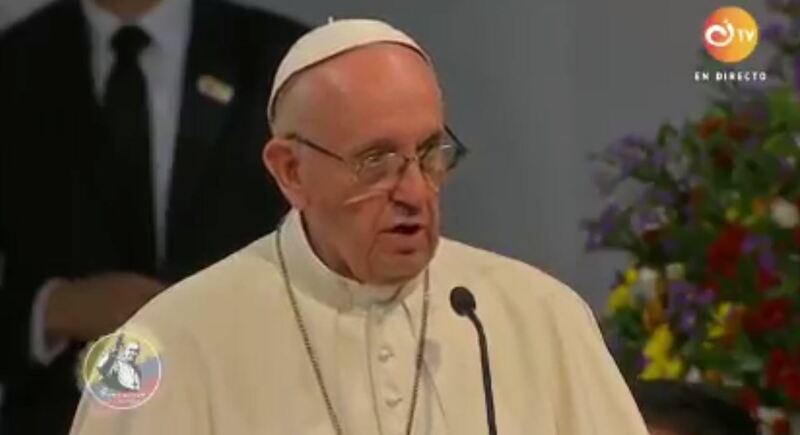 In his remarks, the Pope regretted he couldn’t visit the university during his May 12-13, 2017, visit to Fatima, for the Centenary of the Apparitions, and expressed his joy to be with them today. The Holy Father affirmed the value of Catholic universities and institutions. “Behind the Catholic teacher there is a believing community, in which, throughout the centuries of its existence, a certain wisdom of life has matured; a community that conserves within it a treasure trove of knowledge and ethical experience that is important for all humanity. In this sense, the Pope said, the teacher speaks not so much as a representative of a belief, but above all, as a witness of the validity of an ethical reason. The Holy Father concluded, saying he accompanies those present with prayers, and reminded them to pray for him. Since it was not possible for me to visit your University during my pilgrimage to the Shrine of Fatima last May, you decided that a distinguished representative of the Athenaeum would come to visit me at the See of Peter. I welcome you with joy and greet you with affection. I thank my brother Cardinal Manuel Clemente for his greetings, presenting me the hopes and struggles of all those who today – like others in the past – love, make and form this university community. I congratulate the Church in Portugal which cares for, promotes and supports it, and which is thus able to count on it for a detailed interpretation of current times, and above all for the higher formation of the guides of the People of God and the leaders that society needs. It now celebrates fifty years of service to the growth of the person and the human community: the first is a task of construction over a relatively short time, whereas the second is a work without end. Long life, then, to the Catholic University of Portugal! 1. By nature and mission you are a university , that is, you embrace the universe of knowledge in its human and divine meaning, to guarantee that outlook of universality without which reason, resigned to partial models, renounces its highest aspiration: the search for the truth. In view of the greatness of its knowledge and its power, reason yields to the pressure of interests and the attraction of utility, eventually acknowledging it as the ultimate criterion. But when human beings surrender to the blind forces of the subconscious, of immediate needs, of selfishness, then their freedom sickens. “In this sense, we stand naked and exposed in the face of our ever-increasing power, lacking the wherewithal to control it. We have certain superficial mechanisms, but we cannot claim to have a sound ethics, a culture and a spirituality genuinely capable of setting limits and teaching clear-minded self-restraint” (Encyclical Laudato si’ , 105). In fact, truth means more than knowledge: knowledge of truth has as its purpose the knowledge of good. Truth makes us good, and goodness is true. It is right for us to ask ourselves: How do we help our students not to regard a university degree as synonymous with greater position, as synonymous with more money or greater social prestige? They are not synonymous. Do we help this preparation to be seen as a sign of a greater responsibility in relation to today’s problems, the needs of the poorest, and care for the environment? It is not enough to analyse and describe reality; it is necessary to generate space for real research, debates that generate alternatives for today’s problems. How important it is to be practical! 2. By design and grace of God, you are a Catholic university, a characteristic that in no way harms the university; on the contrary, it enhances its value to the maximum; since, if the fundamental mission of every university is “continuous quest for truth through its research, and the preservation and communication of knowledge for the good of society” (Saint John Paul II, Apostolic Constitution Ex corde Ecclesiae , 30), a Catholic academic institution is distinguished by the Christian inspiration of its members and of its own communities, helping them to include the moral, spiritual and religious dimension in their research and to value the achievements of science and technology from the perspective of the human person as a whole. As John Paul II affirms, “the behavioural sciences, despite the great value of the information which they provide, cannot be considered decisive indications of moral norms” (Encyclical Veritatis splendor , 112). This was what I meant by mistaken reason, when it establishes as its ultimate criterion the pressure of interests and the attraction of the useful. “It is the Gospel which reveals the full truth about man and his moral journey, and thus enlightens and admonishes sinners; it proclaims to them God’s mercy. … God also reminds sinners of the joy of forgiveness, which alone grants the strength to see in the moral law a liberating truth, a grace-filled source of hope, a path of life” ( ibid ., 112). It could be objected that a university teaching of this type draws its conclusions from faith and, therefore, can not demand that those who do not share this faith accept their validity. But, although it is true that while one may not share the faith, one can recognise the ethical reason that is offered. Behind the Catholic teacher there is a believing community, in which, throughout the centuries of its existence, a certain wisdom of life has matured; a community that conserves within it a treasure trove of knowledge and ethical experience that is important for all humanity. In this sense, the teacher speaks not so much as a representative of a belief, but above all, as a witness of the validity of an ethical reason. 3. And, by virtue of your features and presence, you are a Portuguese university . This is another sign of hope that the Church offers to the country, since it places at the disposal of the nation a cultural institution which, aiming at the Christian perfection of man, is called precisely to serve the very cause of man, sure that, as Vatican Council II teaches, “Whoever follows after Christ, the perfect man, becomes himself more of a man” ( Gaudium et spes , 41). I have previously alluded to the need to come down to reality; I wished to remember here the principle being incarnated in the skin of our people. Their issues challenge us; their struggles, dreams and concerns have a hermeneutical value that we can not ignore if we truly wish to follow the principle of incarnation. Our God chose this path: He was incarnated in this world, marked by conflicts, injustices and violence, full of hopes and dreams. We have no other place to find it if it is not in our real world, in your real Portugal, in your towns and villages, in your village. God is saving there. “In Portugal, the dogma of faith will always be preserved” (Memories of Sister Lucia, IV, 5). This is a promise of Heaven left at Fatima a hundred years ago, consolatory and committed, for we know that God alone created man, but did not want to save him alone; He expects our collaboration. And also the collaboration of the Catholic University of Portugal, established fifty years ago, experienced in the light of the consecration of the academic community to the Immaculate Heart of Mary. It was very good for my soul, at the Shrine, to be able to join the prayer of the good Portuguese people and other parts. As I told you then, I went there to “to venerate the Virgin Mary and to entrust to her all her sons and daughters. Under her mantle they are not lost; from her embrace will come the hope and the peace that they require” ( Homily , 13 May 2017). With this certainty, which is transformed into a desire for good for all the family that makes up your academic institution: directors, teachers, students, administrative staff and benefactors, I reiterate my congratulations for your jubilee and bless you all in your work and initiatives. I accompany you with my prayers and, please, do not forget to pray for me. Thank you.